We have two choices: either we live with all this—and condemn future generations to the same, or worse, if they have a future at all—or, we make revolution! This is what we are going to work on NOW. There is a scientific approach that makes clear this madness is unnecessary. 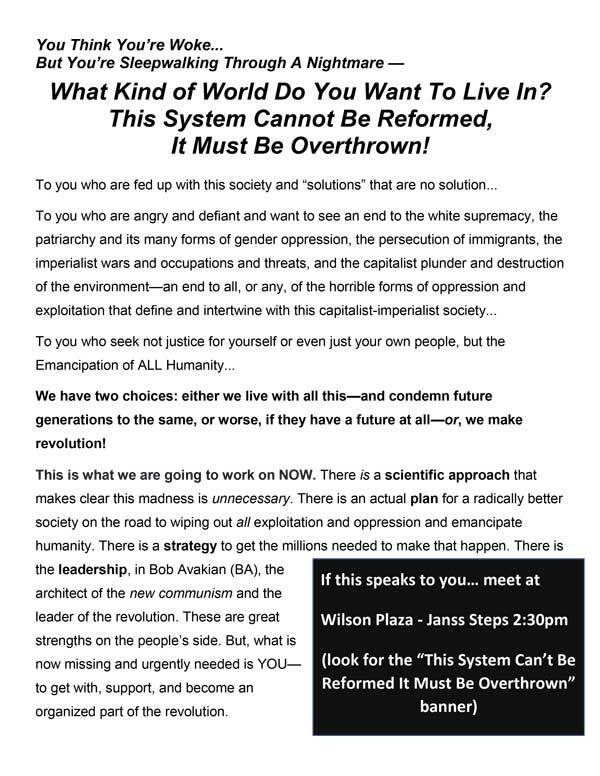 There is an actual plan for a radically better society on the road to wiping out all exploitation and oppression and emancipating humanity. There is a strategy to get the millions needed to make that happen. There is the leadership, in Bob Avakian (BA), the architect of the new communism and the leader of the revolution. These are great strengths on the people’s side. But, what is now missing and urgently needed is YOU—to get with, support, and become an organized part of the revolution. Join those who refuse to accept the world as it is and are carving out a pathway forward for the emancipation of ALL of humanity!